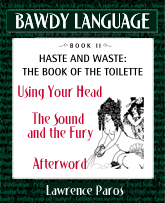 Sampler, the Book of the Toilette 2, Using Your Head, Bawdy Language book by Lawrence Paros. Stand clear, it's shorter than you think. Ladies will please remove their hats during the performance.  Wit and Wisdom from the W.C.
t's obviously time to ask for the facilities, the lavatory (or the abbreviated lav)  an old nineteenth-century word from the Latin lavatorium, "a place for washing." Hoping to disguise your mission, you might request the place where you cough (c. 1920). Speaking more directly, the shithouse (19thC), the can (c. 1900), or the head. Why the head, when "tail" is more appropriate? It could be from the manner with which many relate to authority  a political statement of sorts. Or, as is more likely, from the location of the ship 's facilities  in the "bulkhead." When all is said and done, most Americans need room to do it. Today's favorites include wash-rooms (c. 1878), bath-rooms (c. 1850s), from a time when the necessary fixtures joined the bath, and powder-rooms. The little girl's room (c. 1940s) is still with us today, though its counterpart, the little boy's room, is seldom referred to. Dual-room names continue to dominate the landscape of restaurants nationwide: His 'n' Hers, Gents and Ladies, Gulls and Buoys, Lads and Lassies, and Braves and Squaws (Ugh!). Many prefer the restroom. But if you asked for it in England, your hosts would likely point out the cloak-room or show you to the bedroom. Perhaps you thought yourself couth by not asking for the toilet (c. 1820s-30s), or one of its mutant off-spring the toidy or toy-toy (20thC), but the toilet still works fine there among the working-class.The toilet derives from the French toilette, the diminutive of toile, the cloth once covering the table on which sat one's preparations, making it all very acceptable. The British middle-class, however, prefers the loo (early 20thC), though its origins remain somewhat of a mystery. Some think it derives from the cry "Gardez l'eau!" "Mind the water!" 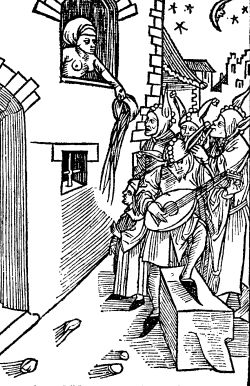  a warning to look out below, supposedly from the days before modern plumbing when emptying chamber pots from upper-story buildings was a commonplace occurrence. Others suggest it is a misreading of room number 100, supposedly a common European toilet designation. Alas, the most popular designation there is "00" (zero, zero). A more exotic theory traces it to Bourdaloue, a long-winded eighteenth-century Jesuit who ended up naming a china urine receptacle to be slipped between a woman's legs. So proper was the loue (the shortened version, popular during the 18th and 19thC) that it could even be used in public when the lady was wearing full skirts. Have all these possible derivations only further muddied the waters? In lieu ("the place" and yet another possibility) of the loo, there's always the water-closet ( les water in France) dating from around 1755 when it first moved into the house from outside, most commonly referred to today as the WC (19thC).